If you haven’t fired up the grill yet, what are you waiting for?! 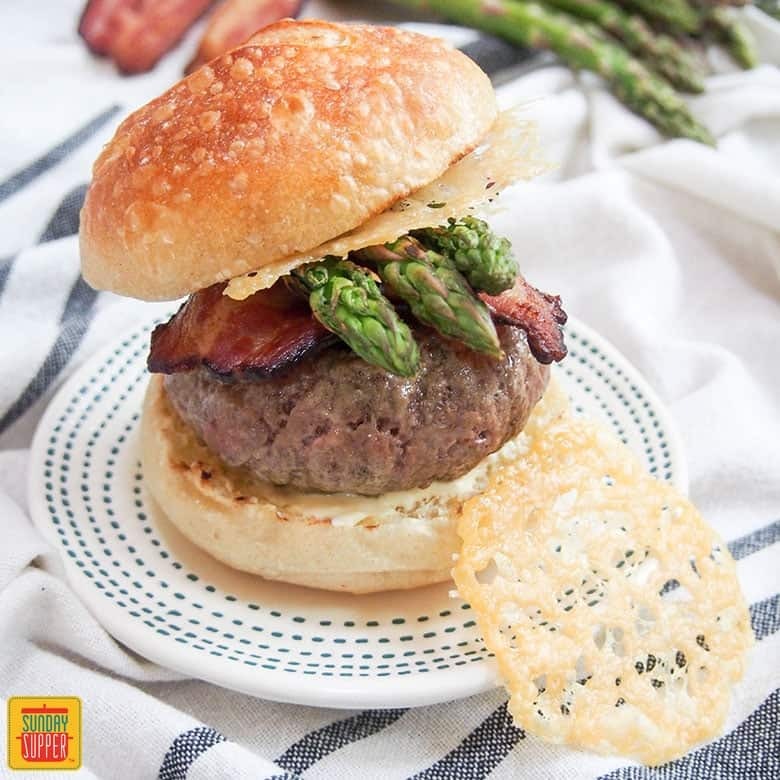 Make our Loaded Burgers topped with smoky bacon, crunchy asparagus and Parmesan cheese for a gourmet burger recipe that will be the talk of your BBQ! You definitely NEED to try these deliciously different, spring-inspired loaded burgers! In our family, Memorial Day is a great excuse to fire up the grill and have a few friends over for an afternoon of eating. We try to keep things relatively easy with some simple sides and a few things to go on the grill. I usually stick to a few favorites and change some other things, but there is always a burger in there somewhere. This year it’s Loaded Burgers with bacon, asparagus and Parmesan Cheese Crisps! Unlike fall, when we might feel more in the mood for maple turkey burgers, this time of year we often go for a loaded burgers made with beef like this Poached Egg Burger or Taco Burgers. I love the ideas in our article 9 bodacious burger recipes, but I was in the mood for something spring-like. 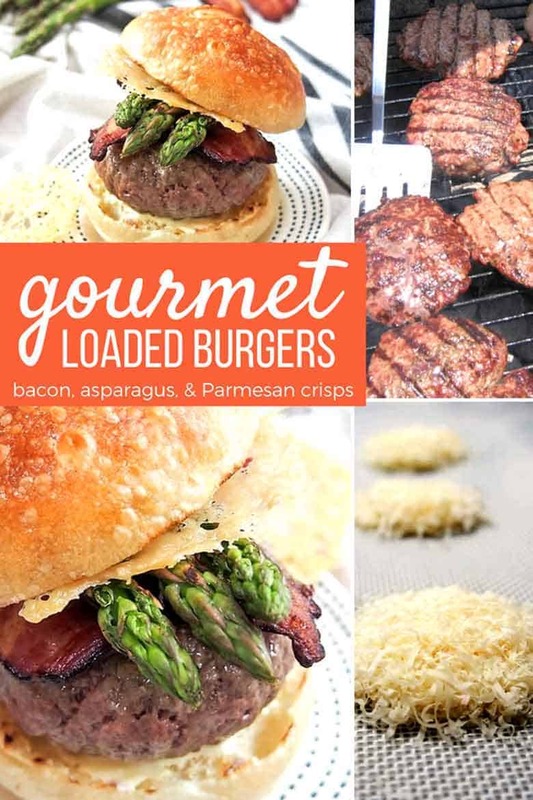 Since we love roasted asparagus with parmesan, and asparagus also goes with BACON, it wasn’t much of a jump to create these Loaded Burgers with bacon, asparagus, and Parmesan cheese crisps! You’re going to LOVE this flavor combo! Our Loaded Burgers might not have cheese in the usual sense of a loaded burger, but there’s Parmesan mixed in the burger and the mayo, along with a crunchy Parmesan crisp on top. I’ve based the Parmesan Crisp on Giada’s recipe on the Food Network site, and while I haven’t added extra in the recipe, I’d suggest making a few extra Parmesan crisps as they’re great to snack on! warm the bacon to the side of the grill as you toast the buns shortly before serving. For maximum flavor and deliciousness, we recommend using Certified Angus Beef® brand beef. It's time to get your GRILL ON! 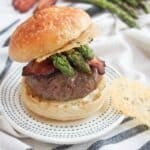 Make our LOADED BURGERS topped with smoky BACON, crunchy asparagus, and Parmesan cheese for a gourmet burger recipe that will be the talk of your BBQ! You definitely NEED to try this deliciously different, spring-inspired loaded burger! 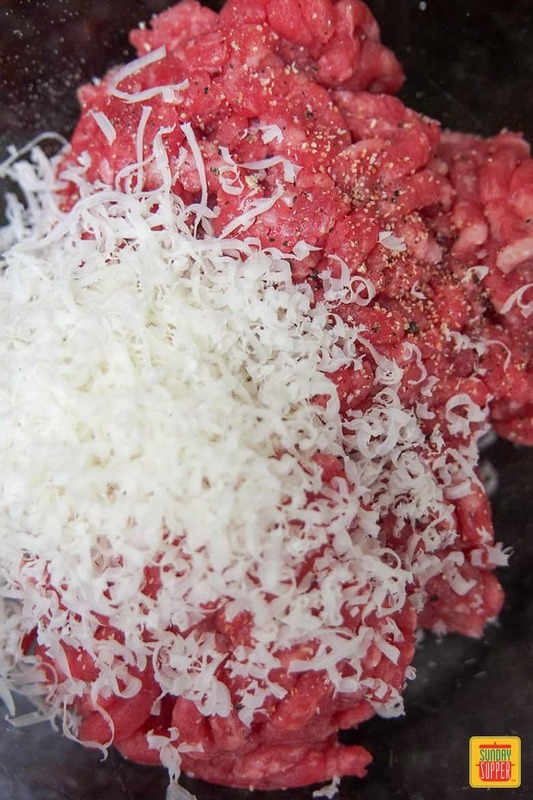 Mix together the ground beef, salt, pepper, garlic and parmesan so well combined. Divide into 4 and form into slightly flattened round patties. Put on a plate and chill at least while preparing rest, but can also be done day before - just cover if longer than few mins. Preheat oven to 400F. 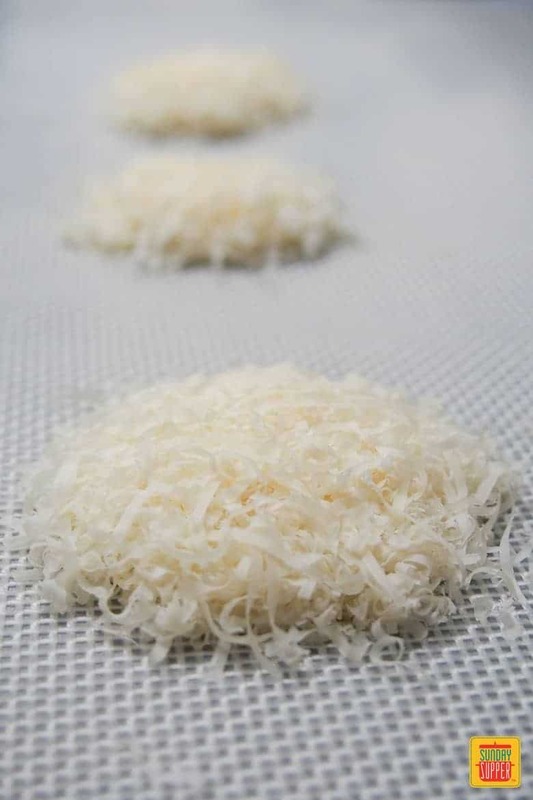 Press some parmesan into a round 1 tbsp measure and then tip onto a silicon baking mat on top of a baking sheet. Gently press it down. Repeat to make 4 round piles then bake for around 3-5 minutes until golden then set aside to cool before lifting from mat. At the same time, I'd suggest you cook the bacon in the oven, then once done, set it aside for later (you can warm at side of grill). Alternatively, you can cook on the grill with burgers but you will need to watch very closely. When ready to cook, preheat grill then cook the burgers to your preferred level of doneness, turning after the first side no longer sticks. After you turn the burgers, add the asparagus to the grill and cook turning once or twice until lightly charred and just tender. Meanwhile, mix the 2 tbsp parmesan into the mayonnaise. Split the burger rolls, lightly toast the cut side then spread with the parmesan mayo. 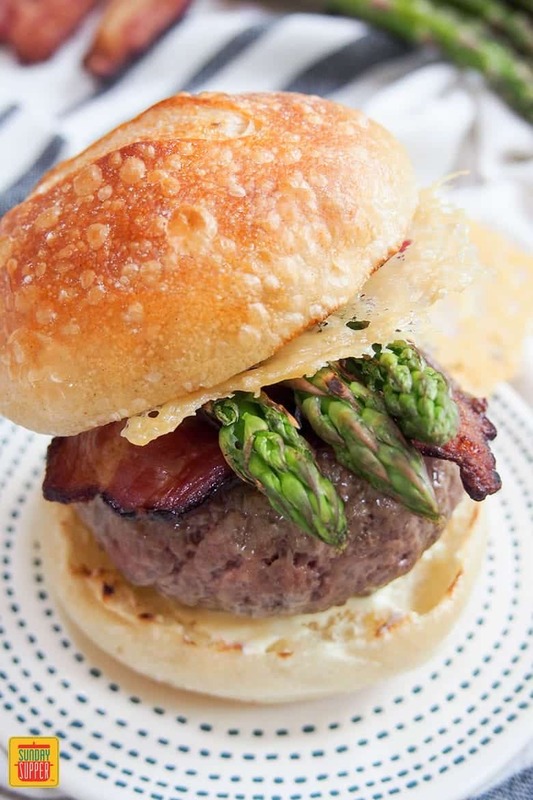 Top the bottom of the rolls each with a burger, bacon (split in two), 3 stems of asparagus (trimmed to be just a little longer than bun is wide - you can add in ends too if they'll fit) and a parmesan crisp. If you want to make these burgers even more 'loaded' then why not add in an egg? If you're unable to grill outside, you can also cook the burgers and asparagus on a grill pan following same basic method - just lightly oil the pan before heating.